Related issues: #5265 NOTE: Wherever possible, use BitCurator packages for forensics tools. 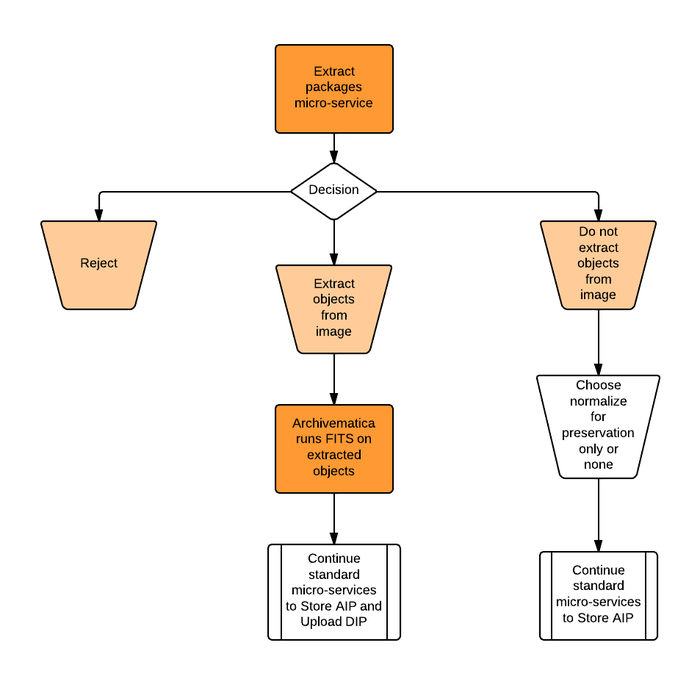 If user chooses not to extract objects, then skip micro-service decision about tool output to base normalization on, choose normalization for preservation only or no normalization, and continue standard micro-services to store AIP. If user chooses to extract objects, Archivematica runs FITS on the extracted contents. 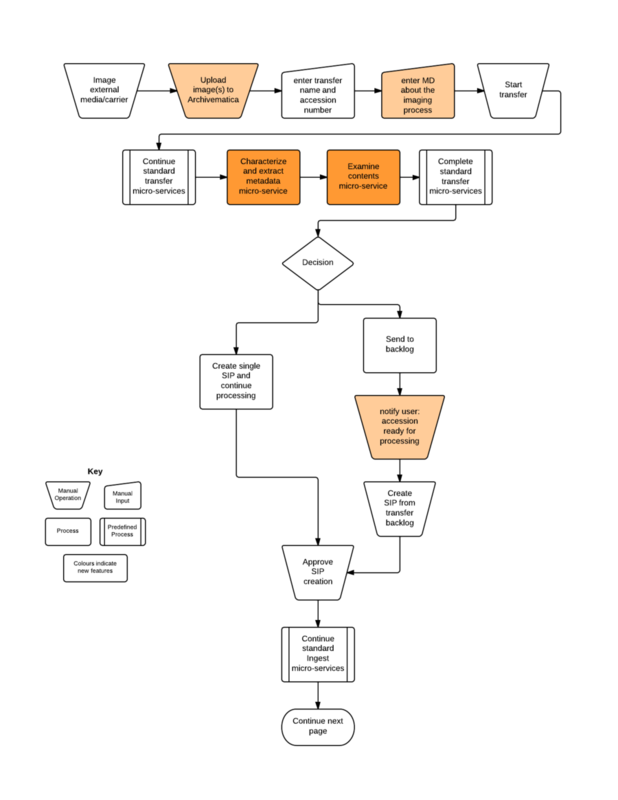 The user continues standard workflow, choosing any of the normalization options (including manual normalization) and continues processing to storage and/or access. In the case of AD1 images, user should be able to choose to extract the objects from the AD1 image before transfer. Archivematica should recognize an AD1 image and issue an alert/warning. If the user chooses to proceed with the transfer/ingest then the AD1 file just gets stored without any normalization or metadata extraction. See associated issues #6093 and #6123. When the user selects Forensic image transfer type, each image uploaded as part of the transfer will include a metadata form icon that, if selected, will open a form in another browser tab. 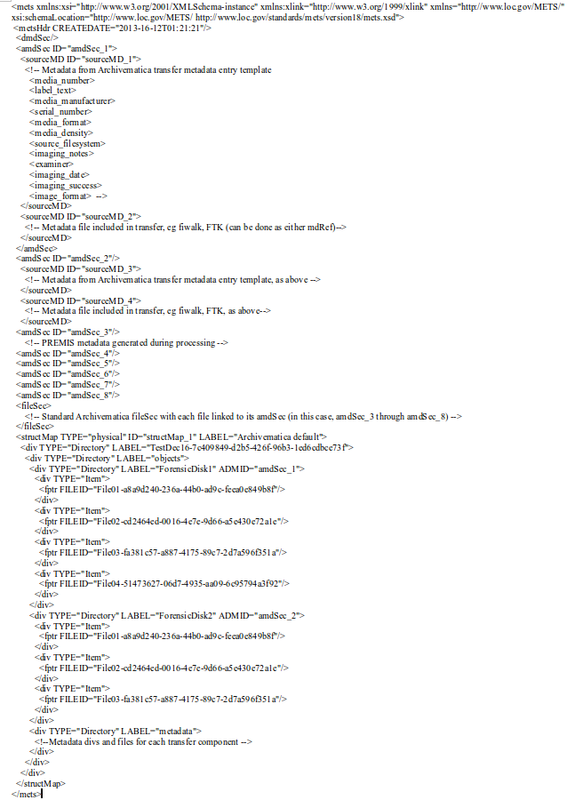 There, the user will enter some or all of the MD indicated below in the Template for manual data entry list. DFXML was considered for the content entered into the template, but was determined inappropriate because the type of content is about the act of imaging and not all about the tool output from the process. The following table contains suggestions for parsing into descriptive systems. provide a unique identifier for the materials being described in accordance with the institution’s administrative control system. Optionally, devise unique identifiers at lower levels of a multilevel description. This page was last modified on 23 March 2017, at 15:31. This page has been accessed 35,056 times.